After years of serving the Nashua area, we've been fortunate enough to build great reputation and foundation in our community. Establishing a strong reputation as one of the best fence companies in Nashua NH and becoming one of the go-to services in city like Nashua isn’t easy. But we believe hard work, quality results, and excellent customer experiences can make anything possible. Now that we’re one of the “big ones” in our community, we're always seeking to keep the work ethic. This website, which is our most recent development in the area, will make it easier than ever. To discover more about us and contact us for a project in the future. Give us a call when you’re ready to talk about your fencing needs. A company is only as good as its employees. And we've crafted a team of highly skilled and hardworking fence builders. Who’ve been building fences long enough to handle anything anyone can throw at them. Whether you have a tight deadline to meet, need fence repair or installation, it’s nothing our teams haven’t done before. We expect the highest standards from our fence technicians because we know our community expects the highest standards from us. Over the years, we’ve been fortunate to hire the best, most professional, dedicated, and skillful fence builders in our area. Nashua Fence Company stakes our reputation on each job, so whatever you need, they're happy to do a great job for you. That’s our guarantee. We offer a wide range of fence services, but we’ve divided them into six separate pages that provide general information. It’s important that our customers feel confident in our services and understand what we do, from repair to installation. The easiest way to do that is to navigate to the service page you think you need right now. It can be hard to find good fence companies in Nashua NH, but look no further! Whether you’re looking for chain link fencing, privacy fencing, or even just fence repairs. Below you’ll find some brief summaries of what each service is about so if you’re a general fencing client. Please feel free to read through at your convenience and get in touch if you have any questions. Residential areas are almost always a pleasure to work in. It’s just a great feeling to be able to help someone improve their home and create the living environment they want. A great fence is not only a practical feature of your property, keeping people and animals out, it can also be a defining feature of your home’s look. With any residential fence we build, we seek to leave you with two things. First, a beautiful fence that you can be proud of, and secondly, a smile of satisfaction on your face. Whether you need us to repair an existence fence or install a great new one, we look forward to hearing from you. Let’s face it, while chain link fencing isn’t made to look amazing, it certainly gets the job done affordably and lasts a long time while doing it. 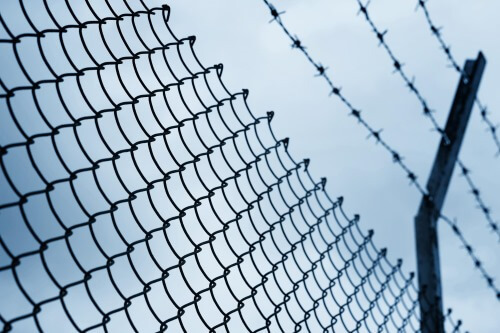 There are many reasons for using chain link over other types of fencing depending on your situation. If you need to make sure nothing gets in or out, chain link is a great choice. To learn more about it, have a look at our services page here and contact us if you have any questions. Vinyl fencing is a synthetic fence material that’s made from Polyvinyl Chloride. If you don’t know much about vinyl then you might be put off by the idea of a plastic fence material, but let us explain why vinyl fencing can be a great choice. Vinyl is moisture resistant, can be made in a large variety of colors to perfectly match your home, it’s cheaper than wood, doesn’t rot, and can be nearly 5 times stronger than wood while being more flexible. If that catches your eye, check out our service page and give us a call with any questions you might have. Wood fencing used to be the only type of fencing available, and while there are many different forms of fences available these days suited to different situations, wood fences have never gone out of style. Through thick and thin, wood fences are still a great choice when built professionally and placed to last. Wood is an incredible and versatile material. If you’re looking for a fence, you certainly can’t go wrong with wood. Head over to our wood fence service page to read more about why it’s so versatile. It is more important than ever to choose a professional contractor who knows what they’re doing when it comes to commercial fencing. The requirements for a commercial fence are very different than a residential fence, and there are a whole pack of different expectations and considerations to be made. You’ll want to find a contractor with the know-how, but also one with qualified employees and the tools required to get the job done right. We match for both those requirements, so if you’re looking to have a great fence built to your specifications, give us a call. Nothing in our world lasts forever, and fences aren’t any different. It’s true they can last years and years if built properly by professionals, but not every fence was built with the same level of skill or with the proper materials. And sometimes they break for other reasons too. Whatever the case is, you should make sure to have a contractor you can rely on to come out and help you out when it happens. As always, it would be our pleasure to service your fences and ensure their longevity. For more information on this, feel free to read over our Nashua fence repair service page where we discuss more specifics of why many fences don’t last as long as they should and how we can make that better. There are several ways to contact us. You can use the form above to request us to contact you, but the fastest way is to just call us at 603-333-1516. You can also just click the button below if you’re on your phone, and your phone app will come right up. We pride ourselves on being the top rated fence company in Nashua and will take great care to ensure you’re happy with your service and that you’re pleased with every step of your fence project, so please feel welcome to call any time of the day. And you're always welcome to follow us on our Facebook page.